Bieber, Justin — Rapper “Big Sean,” as a gift of gratitude for being featured on singer Justin Bieber’s latest album, gave the Biebs a $30,000 ring to solidify their tight relationship. The jewelry was, according to the press, the first ring Big Sean (read: Sean) ever bought for himself after hitting it big. To return the BFF favor, Bieber created the equivalent of a mix-tape for the rapper by paying eighteen live bands show up at his house to perform songs that mean a lot to their friendship. Cruise, Tom — Rumors trickled out this week that Rock of Ages star Tom Cruise keeps his youthful appearance by an expensive beauty regime consisting of a hydrafacial made from powdered nightingale droppings, reportedly a “natural exfoliant” once employed by Japanese geishas. Sadly, it’s becoming age-old story these days: a struggling married couple broken up by the excessive financial demands of extravagant bird feces cosmetic upkeep. Who will think of the children? 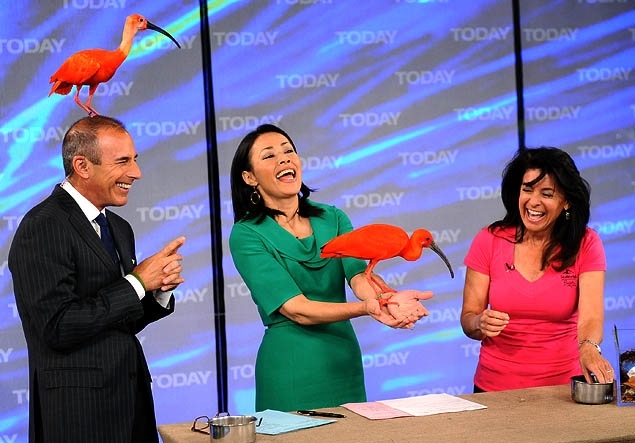 Enjoy this bird, Ann Curry. For it will be your last. Trek, Star — A twenty-four foot long “shuttle craft” from the U.S.S. Enterprise originally used in the 1960’s Star Trek television series was auctioned off last week to an unnamed buyer for over $70,000. The buyer reportedly claimed he was excited about his new purchase, but worried if it will fit into his mother’s basement.